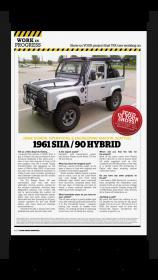 My old girl got featured in Land Rover Monthly (June 2014 edition). First time was in April 2000 when she was cloaked in Camel clothes ! congrats the pics are to small to read the article. What are the details of your Series?